This page is dedicated to George Palmer, who was one of the early pioneers of long distance television reception (TV DX) in Australia. In the 1920s, George appeared in silent movie films. He then married and had a son, George Palmer Jnr. Around this time, George started Melbourne AM radio station 3AK. Subsequently, George married again and had a second son, mining entrepreneur Clive Palmer. George then moved to Surfers Paradise, SE QLD in 1964. George's early long distance television reception experiments commenced back in 1956 at Williamstown, Melbourne, Australia. In 1957, George was the first Australian DXer to receive BBC chB1 England video and audio via multi-hop F2 propagation. George used a specially imported 405 line TV to watch the BBC TV programs. George even recorded the BBC pictures on silent movie film. The 41.5 MHz AM TV sound was also recorded on to open reel audio tape. One of the programs noted was the BBC news. 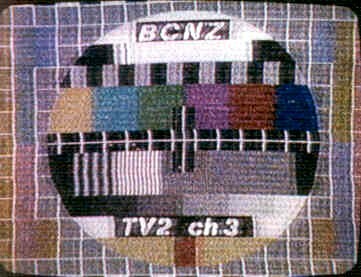 It is also interesting to note that at certain times the BBC chB1 TV signals peaked from the north east, hence were likely via long-path F2. While in Melbourne, George was reported in the May 1957 issue of Radio Electronics magazine, to have had complete UK and USA TV receiving systems set up with antennas on a 90 foot tower - the American system aiming for chA2 Honolulu. During the late 1950s and early 1960s, George sent long distance TV reports to veteran USA TV DXer & journalist Robert B Cooper. Bob well remembers George's TV DX reports, which included London, Honolulu, Manila, Vladivostok, New Zealand, Malaysia & Brisbane. In 1961, Australian TV Week magazine reported that George achieved worldwide TV fame by receiving BBC London television signals in Melbourne in 1957, which is still the current world record for terrestrial TV DX. TV Week also reported that George had received Honolulu, Manila and Vladivostock TV from his Williamstown home. George pioneered more than simply GB television reception - he also built sizeable (6 foot width) projection set systems as early as 1959-1960 and had a fling at marketing them in Australia. George also delighted in receiving DX (Brisbane at 1,000 miles, Adelaide at 450 miles) via what presumably was Es, and showing off the reception to his neighbours on his 90" projection screen (photos of his DX reception also appeared in DXing Horizons along with his off-screen ID shots). China, Malaysia, American Samoa, New Zealand, England, Russia, and all states of Australia. During the mid to late 1970's, George exchanged DX TV logs with Anthony Mann (Perth) and Robert Copeman (Sydney). George also contributed DX reports to Roger Bunney's TELEVISION magazine UK DX TV column. During 1975, George visited Indonesia on the freighter ship Neptune Beryl. Equipped with two National TR505DU TV receivers, wire aerials, and other gear, he was able to receive many stations in Indonesia, Malaysia, Singapore, and Australia. During the voyage he received - while at sea off Florese - a Chinese TV transmission on chR1. Chinese chC1 TV signals were also received near Thursday Island. These receptions occured in the late evening and the distance was over 2,800 miles. Signals from over 2,000 miles were also seen several nights later via evening TEP. Robert Copeman met George, while the Neptune Beryl was at docked at Pyrmont, Sydney, on his way to Malaysia in 1975. 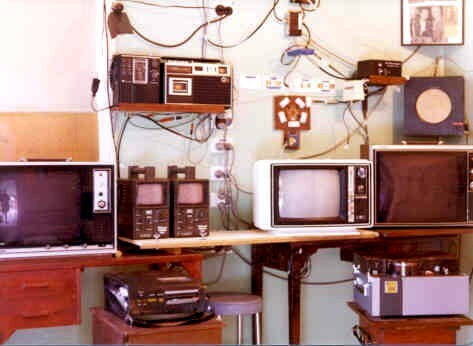 He actually had three National Ranger TR505DU TV sets, but the photo was taken before he had acquired the third set. George's journey on the Neptune Beryl took him from Surfers Paradise, south following the coast of Australia right around until reaching the northern tip of West Australia. From there he went on to Malaysia. On returning he covered the north of Queensland and back to Surfers Paradise, again following the coast. George and his wife, Nancy Palmer, were the only passengers. All others on the boat were crew. George had gained permission to erect a temporary outdoor DX antenna set up on the boat. During late 1975, George received viewable pictures from chE3 55.25 MHz, Johor Bahru, Malaysia, via triple hop sporadic E. Another frequent visitor, which was received around 0600-0900 (local time) was KVZK-TV2 American Samoa. George also reported pictures from KHON TV-2 Honolulu, Hawaii. KHON was received during the early mornings, via F2 + sporadic E propagation. 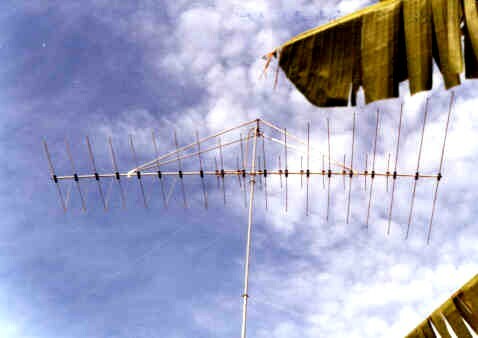 CX28 Crossfire log-periodic 45-220 MHz TV DX aerial at Surfer's Paradise, Queensland in 1975. George Palmer's TV DX shack at Surfer's Paradise, Queensland in 1975. Notice the early model open reel video tape recorder. 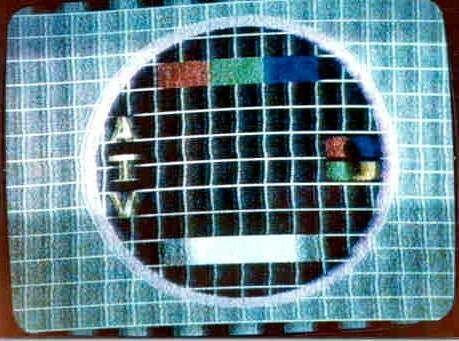 ATV channel 0 Melbourne (46.26 MHZ) received at Surfer's Paradise, Queensland in 1975. Te Aroha, New Zealand ch3 PM5544 received at Surfer's Paradise, Queensland in 1975. 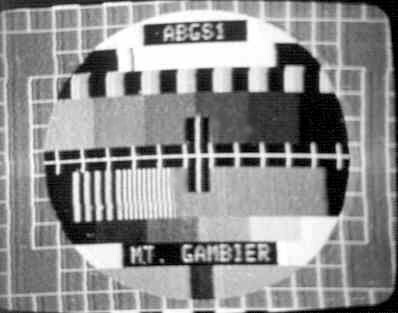 ABGS1 Mt Gambier, SA ch1 PM5544 test card received at Surfer's Paradise, Queensland in 1975. 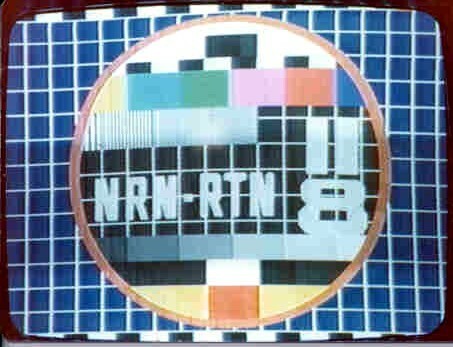 RTN 8 Lismore, TG test card received at Surfer's Paradise, Queensland in 1975. In 1931, George Frederick Thomas Palmer was also the founder of Melbourne 1500 Kilocycles AM radio station 3AK. The station's first broadcast came from George's bedroom at 8 Yerrin St, Balwyn, Melbourne. Further details can be found at The 3AK Story: 70 Years of Melbourne Radio. During the 1930s, George also appeared in several silent movies. In one of the films, George drives a car across the main Sydney-Melbourne train line, seconds before the train passes, jumps from a bridge on to a moving train and punches up a rail employee in a signal box. Plenty of action in the films and a lot like the professional silent movies made in USA at the time. In 1977, George appeared on the front cover of his local Surfer's Paradise newspaper. George had just finished developing a TV projection system. Click here to download George Palmer's 1977 TV projection newspaper article. George was also a licensed radio ham. During the 1980s, George started to concentrate on HF slow-scan TV. We would also like to thank Clive Palmer and George Palmer Jnr, for their additional recollections. We are interested in hearing from any of George Palmer's relatives or friends. E-mail Todd Emslie and Robert Copeman. Copyright © 2015 Todd Emslie.